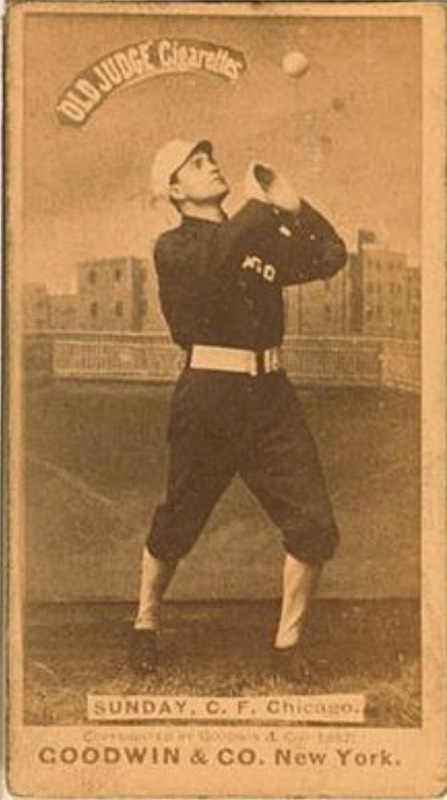 That's right - the famous evangelist, orator and prohibition-pusher that you may or may not have learned about in high school history class was a Major League Baseball player during his younger days. Furthermore, he was a pretty decent ballplayer too. The unique card you see above was made to honor Sunday by a man known as Dave Stewart; no, not the former A's ace or Arizona General Manager. 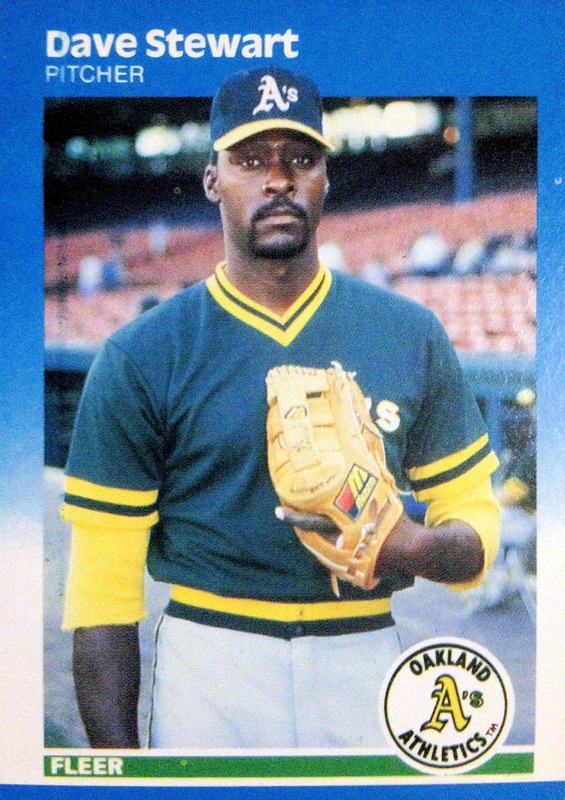 No, no - this Dave Stewart was a disabled Vietnam War Veteran who, back in the late 80's and early 90's, designed and produced his own series of unique baseball cards, which featured obscure subjects like Sunday, Kurt Russell and even "Honest Abe" Lincoln during their days on the diamond. He'd give these cards out to passers-by or intrigued fans in exchange for donations, presumably to pay for his living expenses and the printing these professionally-done, glossy cards. Unfortunately, since that time, no one truly knows what became of Mr. Stewart. All that remains are his fascinating, oddball creations - a legacy in service to our country and baseball cards. That's American, right there. Also - better than being known for trading away Dansby Swanson. Hey-oh! On the other hand, as for the subject of Stewart's entry into my collection, we know exactly what became of him. The Iowa native was born into poverty and even spent some years in an orphanage during his childhood. His father died in the service and his impoverished mother was deserted by a second husband. Unable to afford to take care of her children, Sunday and a brother were sent to live in the Iowa Soldiers' Orphan home. Needless to say, he lived a rough life and saw firsthand the dark, underbelly of American society. Eventually, opportunity in the form of his blazing speed allowed him to figuratively, literally and temporarily run away from his problems, first being recruited out of the home and onto the roster of a for a fire brigade team in nearby Marshalltown, IA. The outfielder's athletic ability caught the attention of one Adrian Anson, one of Marshalltown's most famous native sons. 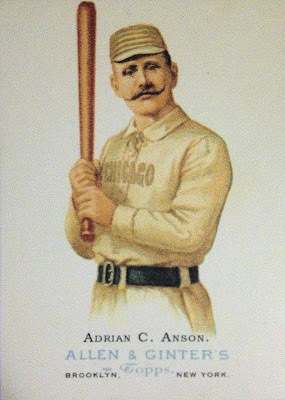 The scout responsible for discovering Billy was actually Anson's aunt, who raved about play of the young baseballer after taking in a local contest. Shortly, thereafter, in 1883, "Cap," was impressed enough to sign Sunday straight onto his National League roster. Too bad Auntie Anson doesn't have a card. Used as an extra fly-chaser for most of his career, he was most notable for his base stealing abilities. 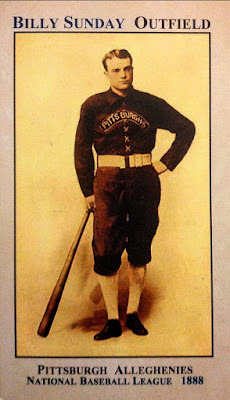 Along the way, Billy stole 246 bases (that we know of - records weren't kept before 1886) over the course of his eight-year career, including a whopping 84 in 1890. It's a good thing he was so fast, because his bat was mediocre, at best, with a career .248 mark. Remember this was an era of inflated statistics and a heavy advantage towards the batter. Nevertheless, his niche skill was valuable enough to secure his spot on Anson's Stockings (later Colts). Speed is a skill that rapidly deteriorates with age, but, it was the wild and crazy lives of his teammates which eventually pushed him away from the game he loved. The legendary exploits of King Kelly, in particular, shocked and appalled the young man. 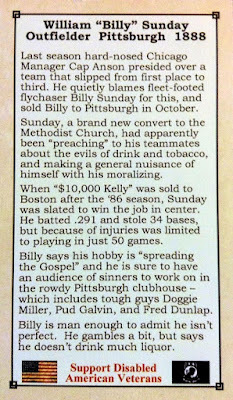 Oddly enough, it was Kelly's spot in the outfield Billy would take when the former was switched behind the dish. A couple of original Goodwin Sundays that I definitely do not own. The Stockings played the game hard and drank harder - they were known to basically live on Rush Street when they were not on the diamond at old Lake Front Park. It was during one of these drunken escapades in 1886 or 87 when Billy and the boys were stopped by a gospel preaching team of orators on the street. Inspired by this enlightening encounter, Sunday soon adopted Christianity and denounced the drinking, swearing & gambling that his teammates adhered to so profusely. 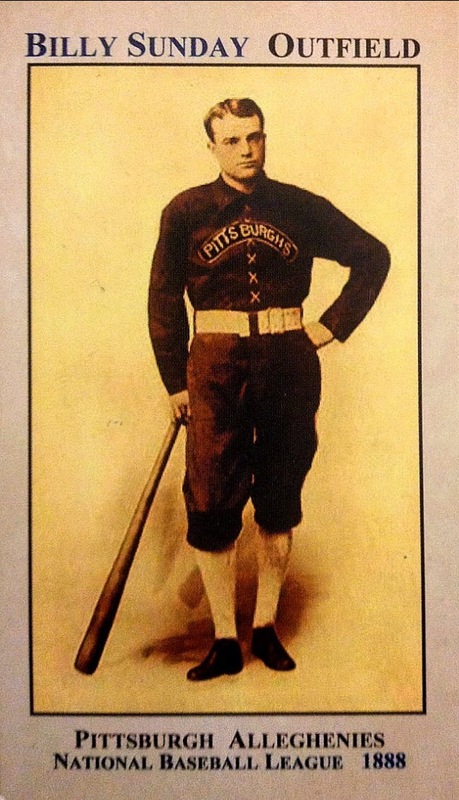 Not too long after that life-altering epiphany, Billy found himself sold to the Pittsburgh Alleghenies (who's uniform he is sporting in the card you see in the card topping this post) for the 1890 campaign. Was it a result of his new-found sobriety and faith? Was Sunday ostracized by his former Chicago mates? Did he request an escape from the Rush Street madness? Doubtful - he had suffered a leg injury the year before and Anson likely figured his speedster spent. 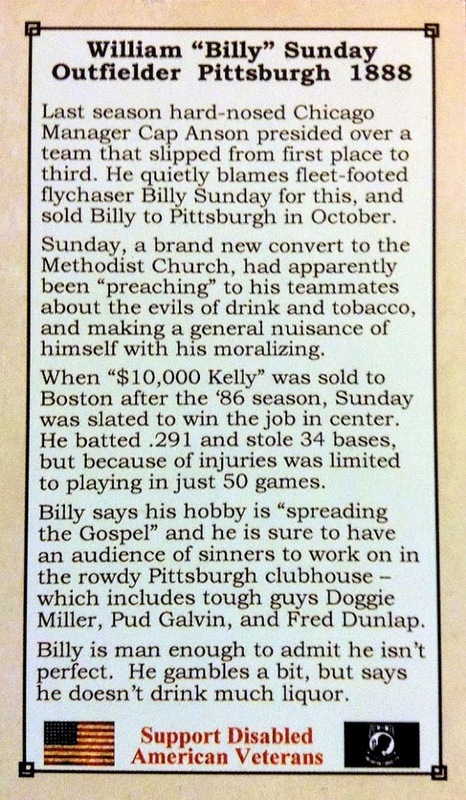 Nevertheless, Billy still had a little bit of baseball left in him. 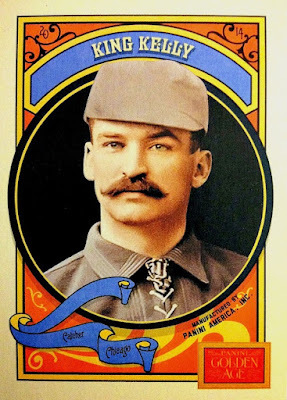 After a few successful seasons for the team that would eventually become the Pittsburgh Pirates and one more injury-shortened schedule in Philadelphia, Sunday had achieved all that he desired to achieve in America's pastime. With that, he decided that his time devoted to baseball would be better spent devoted to God and he walked away from the game at the young age of 27. Sunday certainly knew how to put on a show. 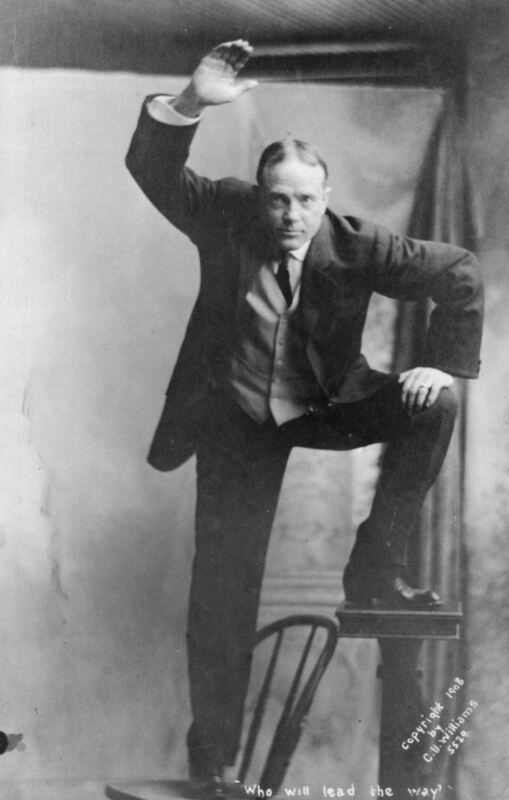 From that point forward, Billy Sunday became one of the most fiery orators of his time, holding evangelical revivals all across the country, drawing audiences of thousands. 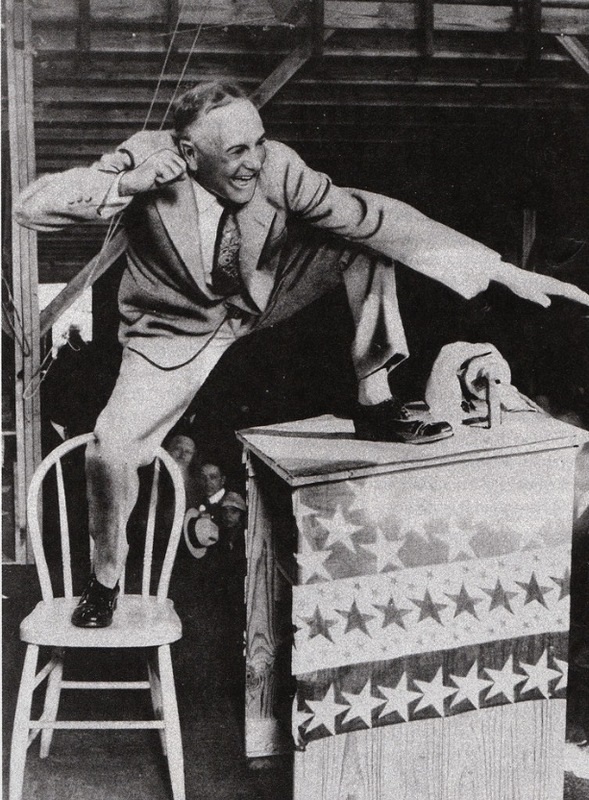 His speaking engagements were wildy unpredictable and entertaining - in an era before the thousands of entertainment options that compete for our attention on a daily basis today, people came from miles around to see what the dramatic orator would do on stage. 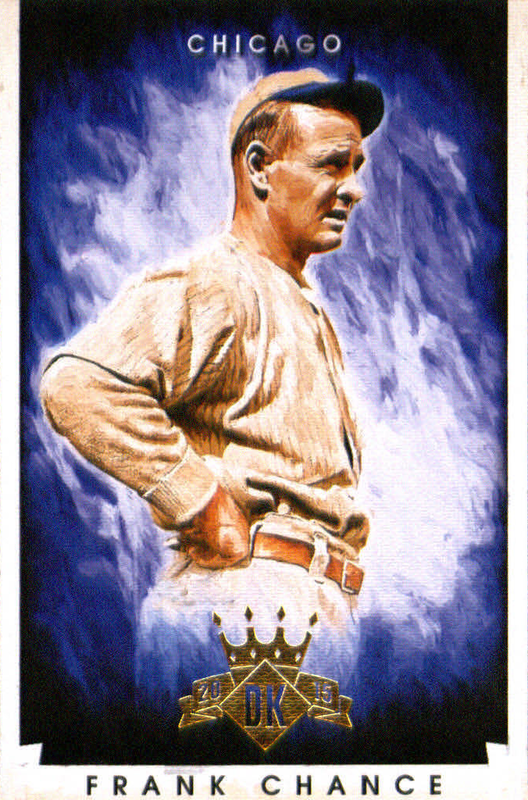 In particular, he held great power and draw in the Chicago area - maybe this was a result of his tenure with Anson's National League ballclub? One of his favorite causes was the prohibition of alcohol - the demon which he saw consume and ruin the lives of several of his Windy City teammates (like the aforementioned Kelly). In fact, his preaching and pushing is often credited as being one of the main reasons that the infamous 18th amendment was ratified in 1919. We all know how that turned out - speakeasies, underground societies, Al Capone's rise to power, and eventual repeal. While the movement might have ultimately been a failure, it wasn't for lack of effort or belief on Sunday's part. Despite his career change, Billy never lost his love for the American Pastime. He often umpired minor league and amateur ball games in towns that he held revivals in, attended MLB contests whenever he could find the time (including a game of the 1935 World Series just two months before he died) and made appearances in old-timers games. The reason that this 2013 Panini Golden Age insert (inspired by the DeLong Gum Co. set) supplanted the Stewart is because it officially lists him as a member of the Cubs - well, Chicago anyway. In my eyes, a Cubs (or Chicago) card always trumps a Pirates (or Alleghenies) card. Sorry, Dave! Also, let's take a moment to appreciate Panini. Though they may lack an official license and their logo-less cards sometimes turn out awkward and weird, their retro-inspired sets are the highlights of their product line. For some reason, cards which represent the olden days don't look nearly as jarring without team markings. It's a shame that Golden Age and Hall of Fame have gone by the wayside - though, we do still have the old-timers pop up in sets like Diamond Kings. 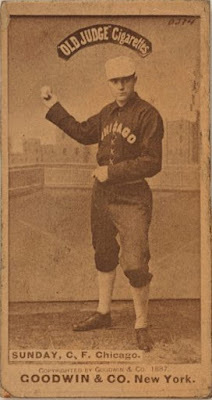 That frustration aside, I felt that this Sunday before St. Patrick's Day would be the perfect day to show off my two-card deep Billy Sunday player collection (the fact that he played well more than a hundred years ago really limits the cardboard options for him). After all, March 17th is basically just a national drinking celebration and, well, his last name is Sunday. The connections are obvious. I love oddball cards like this, especially when it's to honor someone that just NEVER shows up on cardboard, and if per chance they did, the common man cannot own one. And if it fills a slot in your binder, even better. I have the Kurt Russell DAV card but I had not seen the others. Stewart definitely knew how to do a player write up for the back of his cards. Awesome post. I love hearing about the early days of the game. I guess all Chicagoans of a certain age know the name Billy Sunday from the Sinatra song, me included. I'd love another set of Golden Age. 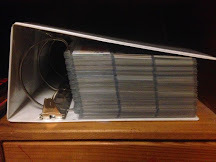 I do have an unopened 2014 blaster in my pack stash.